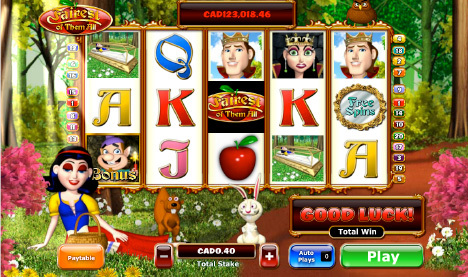 Fairest of Them All online slot game at Fly Casino has the feel of the iconic Snow White and the Seven Dwarfs theme. This 5-reel, 20-payline slot at offers Fly Casino members stunning in-game play providing many bonus features and a huge progressive jackpot award. Try it at Fly Casino today! Sunday 30 Gets 40 X 2! On Sunday from 00:00GMT until 23:59 GMT, all members on their first deposit of just $/£/€30 or more will receive a 40.00 bonus. Claim 2X! 130% Bonus! From 00:00GMT until 23:59 GMT, all members on their deposit of $/£/€30 or more will receive a 130% bonus up to $/£/€130.00. $150 TUESDAY! From 00:00GMT until 23:59 GMT, all members are invited to receive a 75% bonus up to $/£/€ 150.00 bonus on your first deposit of $/£/€ 30 or more.